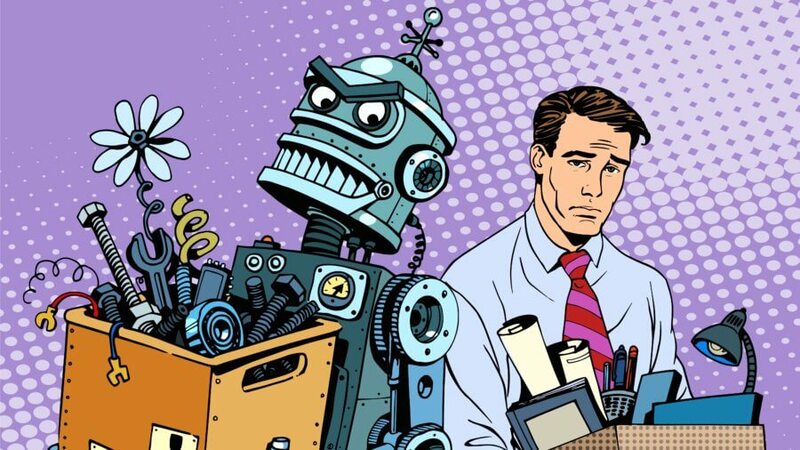 A famous Oxford study on the future of employment from 2013 estimated that up to 47% of American jobs may be automated by 2035; a brand new McKinsey study shows that current technologies could automate 45 percent of job activities; and the business mantra goes that if you can digitize, you should digitize to gain a competitive advantage. But how do we, as human beings, really feel about potentially working with or even for AIs, and what impact do we think they will have on our workplace? The study shows some surprising results in openness, and big geographical differences. 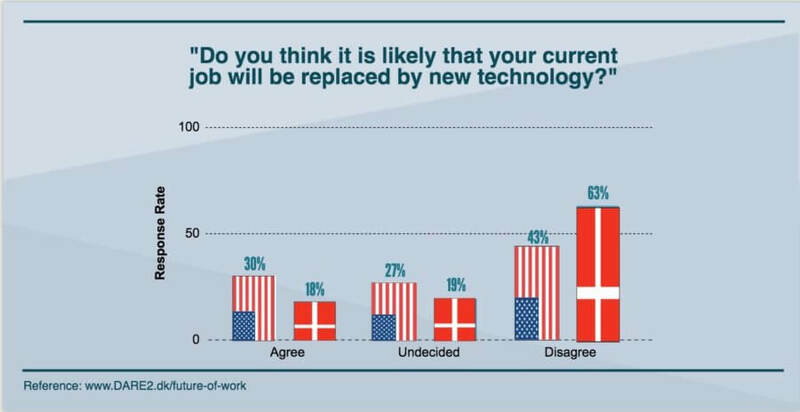 While still not a mainstream perception, 30 percent of US citizens from the study agreed or strongly agreed “it is likely that my current job will be replaced by new technology.” 43 percent disagreed or strongly disagreed. Interestingly, in a country like Denmark only 18 percent agreed with that statement and 63 percent disagreed with it. This indicates that Danes lack awareness of the threat to their jobs, which we know from other studies is very real. Digitization and automation is moving at a much faster pace than most people think. Are AIs more ethical and trustworthy than humans? AIs should make better evaluations than human beings, if they can do so without the personal, social and cultural biases that influence human decision making, particularly in regards to areas like job performance, which can be supported by quantifiable measures. Given that it is within narrow AI with a dedicated purpose that we are seeing the strongest development (think IBM’s Watson beating humans at Jeopardy or Deep Mind beating the Go champion), this is exactly what we will see much more of in the shorter term. But we must also not forget it’s not a given that AIs are, or will be, without bias as long as they are designed by humans (see the very good read Weapons of Math Destruction, by Cathy O’Neil, for more on this topic). Is a poor work environment a competitive advantage? This points to a much deeper issue: a general discontent with one’s workplace. According to the 2014 Conference Board Job Satisfaction survey, 52.3 percent of Americans are unhappy at work. One third are apparently so unhappy that they would replace their bosses with an AI. Interestingly, only five percent of Danes agree with this statement, while a whopping 81 percent disagree. Danes’ general job satisfaction is also much higher. A new study by the European Commission shows that 94 percent of Danish workers are satisfied with their conditions at work. And, by the way, Danes are also rated the happiest people on the planet according to the World Happiness Report. 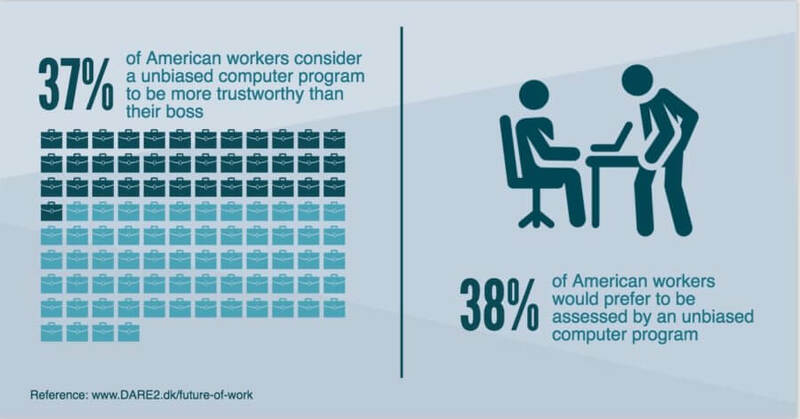 When asked about their workplace being managed “by an unbiased computer program together with a human manager rather than by a human manager alone,” Americans’ agreement rises to 45 percent, and Danes’ to 17 percent. The interesting dilemma here, and a thesis to explore further, is that there seems to be a correlation between happiness at work and openness towards AIs in the workplace. Americans are far more open to AIs at work, even as managers, than Danes, and they are far less happy at work. Common sense and several research studies suggest high job satisfaction creates a competitive advantage. But perhaps this will not be true in the future. As companies increasingly digitize and automate—also on management level—this study suggests they will have more support in doing so in American companies because existing work culture is perceived as being more ripe for cultural disruption. In Denmark, where almost everyone is satisfied at work, there is far less perceived need for change. Will this happiness turn out to be a disadvantage for Danes in the longer term because it will hold back digitization and automation in the workplace? Will a poorer work environment in the US turn out to be the country’s biggest competitive advantage? What if we could combine the two—a high degree of digitization plus a high level of happiness at work? Imagine what that could let us achieve. If you want to know more, contact Kris Østergaard, Chief Innovation Officer, DARE2 & Faculty, Singularity University: kris@DARE2.dk or +45 4181 8151. Co-founder and Chief Learning & Innovation Officer of SingularityU Denmark, a collaborative venture with Singularity University. Faculty at Singularity University, an alumni and co-founder of the SingularityU Copenhagen Chapter.